Lycanthropy is a supernatural condition that causes a person to transform into a were-creature: an unnatural crossing between a beast and their original species. Originally created by the Daedric Prince Hircine, it has been called a disease, a curse, and a blessing. Lycanthropy is contagious, and not selective about who it afflicts; most mortal races are susceptible to it. There are several known strains of this condition, most of which are specific to certain regions of Tamriel. However, the most common strain - which causes the afflicted to turn into werewolves - is known to occur across the whole of the continent. Strictly speaking, the word "lycanthrope" originally referred only to this strain, but it has long been used to refer to anyone who undergoes a similar beast transformation. Lycanthropy was originally created by Hircine, who bestows it as a "blessing" upon devotees and great hunters. Followers of Hircine can also ritually bestow this blessing upon others, and can even replace vampirism with lycanthropy. However, lycanthropy is also a contagious condition. Close contact with a were-creature can transmit a special disease, which progresses to full-blown lycanthropy within a few days (if untreated). For instance, Sanies Lupinus can be contracted from werewolves, and over time will convert the afflicted into a werewolf. Drinking a were-creature's blood is a much more potent means of transmission; it immediately converts the drinker into a lycanthrope. The first transformation occurs within moments, and is unusually intense. Finally, there are a few rare families in which lycanthropy is a hereditary condition. It can remain dormant for generations, only to spontaneously reassert itself in later descendants. The most important and obvious effect of lycanthropy is the beast transformation itself. While in beast form, the lycanthrope has increased strength, speed, resilience, and stamina, as well as enchanted claws that can harm creatures that are immune to conventional weaponry. Wolves and even bears may have a special affinity for werewolves, being less likely to attack them, and sometimes actually hunting with a werewolf. Were-creatures are affected mentally as well, experiencing intense bloodlust and, in extreme cases, amnesia. Were-creatures are commonly believed to have an aversion to specific herbs. Canis root is believed to ward off werebears, while wolfsbane and belladonna are both known to be poisonous to werewolves, and are used as components of remedies for the disease. Silver weapons are also considered especially effective against werewolves. The circumstances of the transformation seem to vary wildly between individuals (or perhaps between strains of lycanthropy). Some lycanthropes transform monthly, or even nightly. Others seem able to choose the times of their transformations, even able to give up transformation entirely. The strength of the bloodlust also varies, with some individuals experiencing an uncontrollable desire to kill, and others able to maintain nearly complete control during a transformation. In the worst cases, an individual who lacks the willpower to control a transformation may go feral, becoming little more than a mindless beast. A few effects of lycanthropy are present outside of transformation. Lycanthropes are immune to all diseases and experience fitful sleep. They also may retain subtle physical traits outside of beast form, such as scents, or small patches of fur. Lycanthropy also has spiritual effects that persist after death. Lycanthropes go to Hircine's Hunting Grounds after death, rather than the afterlife they would otherwise have received. Hircine can grant more power and control over lycanthropy to favored worshipers. This is usually done via a specific artifact such as a ring (see below). Additionally, those favored by Hircine may be granted the ability to transform entirely into a beast rather than a were-creature (e.g. into a wolf rather than a werewolf). 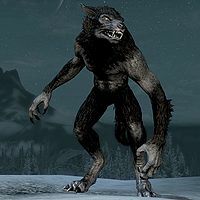 Due to the dangerous and bloodthirsty nature of lycanthropes, as well as the connection between the condition and Daedric worship, it's little wonder that lycanthropes have been hated and feared through much of Tamriel's history. While feral were-creatures are almost universally despised, lycanthropes with control over their condition may be treated in any number of ways, including being revered (among cults of Hircine), being uneasily tolerated or shunned, having their beast transformations criminalized, or even being killed on sight. In one of the most extreme cases, Imperial soldiers were instructed to turn themselves in for "immediate execution" if they became infected with lycanthropy. Individuals that specialize in tracking down and killing lycanthropes are known as werewolf hunters. These may work alone or in small groups, or they may be part of a larger organization dedicated to wiping out lycanthropy (such as the Silver Hand or the Vigilants of Stendarr). Werewolf hunters often target vampires and Daedra worshipers as well. Werewolves commonly form "packs" apart from the rest of society. This makes them a more formidable opponent for werewolf hunters, and also gives them the opportunity to satisfy their instinct to hunt together. Werewolf pack leaders are sometimes designated by Hircine, being also leaders of his cult. Before the Green Pact, the Bosmer constantly shifted from one form to another. The Green Pact fixed the forms of the Bosmer, but they retained the ability to shapeshift into were-creatures, powerful beasts, and a variety of other monsters. Shapeshifting by any means, other than the ritual that begins the Wild Hunt, is forbidden by the pact. As a result, Green Pact Bosmer will condemn anyone who willingly transforms to the Ooze. It is well known that lycanthropy can be prevented by curing the disease that causes it, which must be done before the subject's first transformation. After this point, it becomes extremely difficult to obtain a cure. The witches of the Glenmoril Wyrd are the only beings known to have possessed cures of a conventional nature, potions and scrolls that are relatively free of side effects. Unfortunately, they seem to guard their secrets closely, and do not openly offer these cures. The Silvenar, being a living representation of the Green Pact that fixed the form of the Bosmer, has the ability to instantly cure Green Pact Bosmer who unwillingly contract lycanthropy. Transmitting the condition to someone who already has dormant, hereditary lycanthropy. Infecting such a person will cause the condition to be completely transferred, curing the original lycanthrope. Undergoing a ritual performed by the Glenmoril witches. The witches sacrifice an innocent, infect the victim's flesh with the client's lycanthropy, and resurrect the sacrifice. The original lycanthrope must then kill the victim a second time, which will also permanently destroy their inner beast. Using the magic from the head of a Glenmoril witch to summon one's inner beast as a spirit, then destroying that spirit. Finally, lycanthropy can be supplanted by vampirism. Under normal circumstances, this is impossible, because lycanthropes are immune to disease. However, a pure-blooded vampire can convert a lycanthrope into a vampire lord, instantly replacing Hircine's gift with that of Molag Bal. In general, were-creatures do not revert to their original form upon death, but there may be some exceptions to this rule. Aside from capturing, killing, or curing lycanthropes, there are few methods of preventing them from harming others if they are not able to control their transformations. The simplest solution is isolation. Lycanthropes that live far from any settlements, especially when well fed, are less likely to harm other sentients. Despite their bloodlust, it seems that some lycanthropes manage to live on a mostly plant-based diet in the wild. 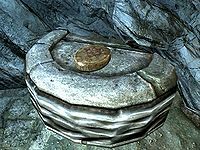 A second method is to use the Ring of Hircine to grant control over transformation, but relatively few lycanthropes have ever been able to obtain the ring. A third, perhaps unique method was employed by the werewolves of Kerbol's Hollow in the Second Era. There an entire village of werewolves was bound together in a ritual that suppressed their bloodlust and transformations entirely, leading to the appearance of a cure. However, this state was fragile, since if even one villager were to leave, the spell would be broken. Furthermore, the ritual had troubling side effects, subjecting the minds of those affected to the will of the caster, and changing their personalities. Werebat Valenwood, particularly Shademist Moors. Werecrocodile Black Marsh and southern Morrowind Known to lurk in isolated swamps. Weredaedroth Only one was ever created by Hircine, for a battle with Sheogorath. See 16 Accords of Madness, v. VI. Wereshark Unknown, probably seas No primary source sightings are reputable; possibly created by folklore or myth. Werevulture Valenwood Not to be confused with Hagravens, which are irreversibly transformed by an arcane ritual. Werewolf All areas of Tamriel The most common form of lycanthrope. Hircine's Ring can give those afflicted with the disease more control over their powers. In some incarnations, it has the ability to prevent a monthly transformation, and allows the lycanthrope to transform as often as they'd like. It has also been used to transform people who aren't infected with lycanthropy into werewolves. Hircine once cursed this artifact to have the opposite effect; the wearer would transform at random and unpredictable times, until the curse was lifted. Other blessed rings are known to exist that can enhance beast forms. Once used in the Bloodmoon Prophecies, they are still possessed by the Frostmoon Pack of Solstheim. The Totems of Hircine are said to date from prehistoric times, before even speech was invented. Each one grants a special power to any lycanthrope who possesses and reveres the item. A carved wolf skull, which enhances the lycanthrope's power to inspire terror. The carved thigh bone of an unknown animal, which enhances the lycanthrope's senses. A simple drum, which gives the lycanthrope the ability to call allies. Upon death, lycanthropes go to Hircine's Hunting Ground to hunt with him for all eternity. The Hunting Grounds are considered by some lycanthropes to be an ideal afterlife, but others feel that this denies them a true paradise. The realm is made up mostly of dense woodland and vast grasslands and plains, as well as blood-red tributaries. Mortals entering these realms are typically hunted down by the inhabitants. During the day, werebears hunt the inhabitants and at night, Hircine announces himself with a pack of werewolves. Esta página foi modificada pela última vez à(s) 12h40min de 21 de maio de 2015.